The Angkor Pass is the entrance ticket to all the Angkor temples and monuments in the Siem Reap area. There are several options regarding how many days the pass is valid. All passes are issued with a picture. US$ 20 for one day. A one-day visit pass allows you to see the highlights of the most famous temples but very little more. US$ 40 for three days. The three day pass is valid for one week, i.e. 3 days to be used within the week, not necessarily consecutively. Three days is sufficient to visit all of the major temples once, a few of the minor ones and have a little extra time at your favorites. US$ 60 for one week. The seven day pass is valid for one month, i.e. 7 days to be used within the month, not necessarily consecutively. Seven days is enough time to really explore some of your favorite ruins and visit many of the minor structures as well. 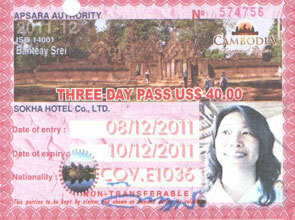 The fee must be paid in US dollars, Cambodian Riel, Thai Baht or Euro. Credit cards are not accepted for payment, but there is a bank counter at the ticket sales booths, where visitors can get a cash advance on their credit card. Visiting hours are 5:00AM - 6:00PM. Angkor Wat closes at 5:30PM, Banteay Srey closes at 5:00PM and Kbal Spean at 3:00PM. Always carry your ticket. It will be checked upon each park entry and at major temples. There is a significant fine for not possessing a valid ticket inside the park. A regular admission ticket is not required to visit Phnom Kulen, Koh Ker or Beng Melea but there is a separate entrance fee of $20, $10 and $5, respectively. For the comfort of foreign visitors, these prices include use of the sanitary facilities in the park without charge. These prices do not include special permits for picture taking or film shooting. Entry is free for children under 12 years old. Children 12 and above must pay full price. Angkor Passes issued between 5 am. in the morning and 5 p.m. in the afternoon are valid the same day. Angkor Passes issued after 5 pm. in afternoon are valid the same day until sunset and also the next day. Entry is free for all Cambodian nationals. There are no discounts for groups. 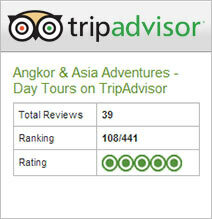 The Angkor Pass is not refundable for any reasons.